Mike Tarpey, Class of 1991 - As head coach of the Ladue Horton Watkins High School varsity football team, Tarpey lead the Ladue Rams in winning the Class 4 state championship against MICDS 48-11, securing the team’s first varsity football state championship in school history. Tarpey is also dean of students at Ladue High School. 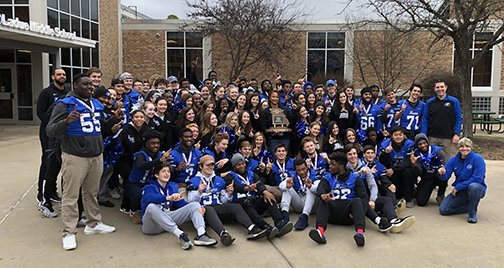 Coach Mike Tarpey (standing at right) is shown with the Ladue Rams as they visit a school after their state championship win.